Obviously the game of golf revolves around one simple item, the GOLF BALL! Without golf balls we would be hard pressed to play the game of golf. In this travel adventure through the history of golf balls, we want to look at the game of golf through a "looking glass" and get an overall sense of that "thing" which we tend to hit off trees, houses, rocks, etc. and quite often end up with in the "Rough"! Incidentally, I will be using both the terms "Golf Ball" and "Golfballs" in this article as I have found that approximately 35% of golfers' worldwide use the term "Golfball"! As of this year in golf history, the golf ball market is HUGE, worth in the neighborhood of $500 million dollars in annual sales! Approximately 800 million golfballs are being manufactured and shipped every year. There are approximately 800 different designs and models of golfballs that conform to the standards set by USGA rules. Today, golfballs are made in either two or three distinct sections or parts. For the beginning golfer, two-piece balls made of rubber and plastic are readily available. These balls are made to last longer and play easier for the casual golfer, and represent approximately seventy percent of all golf balls produced. The three-piece golf balls played by scratch golfers consist of a plastic cover, windings of rubber thread, with a solid core or a shell that contains sugar and water or a select liquid gel. In this essay on golfballs we want to present a brief overview on the subject, with a more comprehensive coverage on each element of the golf ball at a later date. Around the year 1550 in Scotland, "golf" players utilized wooden golf clubs and balls to play the game. They played the game in large sheep pastures in a rather casual manner. In about 1617 the "Featherie" was introduced to the game. 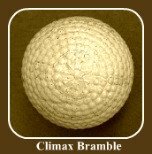 This golfball was handmade with very fine goose or duck feathers tightly packed into a cowhide leather "ball-shape". The feather-leather combination was soaked in water to later dry into a hardened ball. The completion of the "ball" included a type of paint or varnish applied liberally to the exterior surface. It has been documented that Leith and Henry Mills along with Andrew Dickson were known to be the primary golf ball makers living in St Andrews, Scotland. The Reverend Adam Paterson of St. Andrews, Scotland designed, 'manufactured' and introduced the Gutta Percha ball (Slang term 'Guttie') around 1847 or 1848. 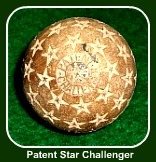 The Gutta Percha ball was made from the sap of the Gutta Rubber tree which was imported from tropical areas. The Gutta Rubber was quite pliable when heated and poured into crude "golfballs" which when later cooled formed a rather decent sphere of solid rubber to be used as a golf ball. The production costs were lower, which allowed more people to buy the balls. The 'Guttie" ball could also be re-conditioned by an application of heat and subsequently could be re-shaped. Allan Robertson was noted to have placed his 'stamp' on this particular make of golf ball. In about 1881 Gutta Percha balls were now made with a texture on their surface in an attempt to replicate the distances attained by the old scored and battered Featherie! In 1890 Gutta Percha balls were produced with a molding process which further increased their quality, consistency and lowered the cost even more. 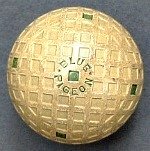 The Dunlop Rubber Company began mass producing the Gutta Percha ball with raised spherical bumps over the surface of these golfballs to give them truer and longer flights. They called this design the 'Bramble'. In 1898 a Mr. Millison developed a thread winding machine for producing rubber strands which were wrapped around a solid rubber core and encased in a Gutta Percha rubber shell. In 1901 Coburn Haskell introduced the newly founded one-piece rubber-cored ball which was used for the first time in the United States and British Opens. In 1905 William Taylor transformed the aforementioned humps into 'dimples' which minimized the air drag on the ball while at the same time provided 'lift' to the golfballs for higher and longer flights. The first known 'golf ball dimples' were in a rectangular pattern. This design did not last long because the rectangular 'dimples' collected mud and negatively affected the ball flight! The 'dimples' were then changed to a concave cup-shape which gave the ball much more lift and distance. To this day the cup-shape 'dimples' still performs the best. In 1906 the Haskell ball was manufactured by B.F. Goodrich with a compressed air core which expanded with heat and blew up! During 1921, the United Stated Golf Association established weight and size standards for the golf ball. Currently there is a great variety of balls designed for amateurs and professionals alike. Some balls are meant for practice only, and others are constructed for control and/or distance. United States Golf Association changed the standards on the golf ball in 1932. The maximum weight was set at 1.620 ounces, and the diameter could not be less than 1.680 inches. Later on when testing devices were developed to measure velocity, the maximum velocity of 250 feet per second was added by the USGA. Today's modern golf balls consist of multiple layers of various synthetic materials such as urethane blends and 'Surlyn'. According to the number of layers constructed within the ball, they are classified as two piece golf balls, three-piece, four-piece, and even five-piece construction. Through golf ball technology, advances in aerodynamics, and incorporating space-age materials in construction of the golf ball, manufacturers can produce balls which are custom-tailored to a golfer's specific game, golf course conditions, and even weather fluctuations. We hope you have enjoyed your travel through golf ball history with us! We will be adding articles soon on the design, construction and physics of the golf ball. Stay tuned! Thanks again so much for Visiting Us! P.S. We will tease you just a bit with some very unusual and rare antique golf balls available for purchase to add to your golfball collection! I found a wonderful website which deals in rare and unusual antique golf clubs and balls. They have a good deal of other antique items as well.